Oh the weather outside is frightful, but the fire is so delightful…. its the time of year for snuggling down with a good book. We have spent a couple of Sunday afternoons companionably reading; the ticking of the clock being the only sound to compete with the beating of the rain on the windows. One of us will break to make a pot of tea – usually there’s some cake or other. I read many books at once: a lot of spiritual development books that simply cannot be read in one go, sometimes it is nice just to read something that is not to taxing. This book is a lovely read, the main character, Rosie, is very endearing, she leaves behind a rather grey existence in London to travel to a remote village in Darbyshire to tend to her elderly aunt, Lillian. Alongside the Rosie’s tale is Lillian’s story of lost love, a wartime romance that was never given the chance to grow. I found Lillian’s story deeper and somehow more substantial than Rosie’s comical exploits as she comes to term with living in a strange place. There appears to be a quotations from a ‘book about sweets’ with most of the chapters having a page dedicated to a particular type of sweet – old fashioned ones, fudge, liquorish etc. It is never quite clear if this is Lillian’s writing or simply quotations from an old book. With all three being separate it made it rather difficult at first to get into the story, but by the middle I became used to the disjointed nature. While it is a fairly satisfying read, I felt that it could have been better. I was waiting for Rosie and Lillian to bond, but oddly enough they never really have a good conversation. I found it most odd that Rosie arrived at Lillian’s house late in the evening and the following morning Rosie simply gets up and leaves the house to explore. I found that a little unbelievable, it would be incredibly rude so the relationship between these characters never really establishes itself. Rosie does nurse Lillian, but they are kept apart, the writer even resorts to conversations held on a child monitor. 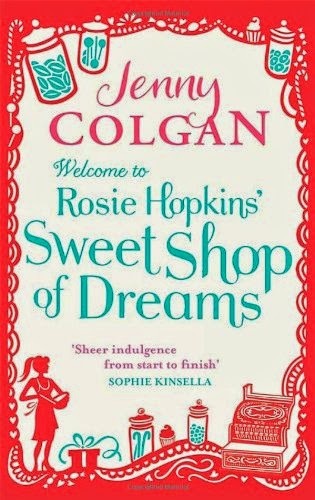 I imagined some form of connection between old and young, with Lillian tutoring Rosie in the art of sweet making, but all that happens is that Rosie simply orders sweets from suppliers. The sweetshop could have been far more magical. The sudden emergence of another character to help run the shop so that Rosie can spend time with her man seemed a bit too easy. I miss Mauve Binchy, she would have really brought the characters alive, I used to end her books feeling I was saying goodbye to dear friends, but I did not have that connection with Rosie or Lillian. Its an enjoyable quick read, like eating a boiled sweet, nice while it lasts but not really substantial, but then that is what Chick Lit is after all.